Veronika Martin spoke about her work in conflict zones in Asia and Africa, how her family history guided her there, and what she learned from the human connections made during these difficult times. My mother was born in 1924 in a small town at the base of the alps in northern Italy. My father was born in 1927 in the thriving city of Leipzig Germany—which later became East Germany. If you know your history, you’ll know my parents were both teenagers during World War II. As a child, I grew up hearing stories about the war almost every day. Mainly from my mother who would talk about her time during the war as a young woman while we sat together at lunch. I remember this from the time I was a little girl before I ever started going to school. Sometimes they were funny stories about the lengths her family would go through to make food taste better when they had no salt; or the debates over whether or not a local cat or horse ended up in the stew pot during more desperate times. Other times the stories were much more serious. How the German SS- Hitler’s notorious elite – had occupied their village- declaring it a “bandit area” and how absurd this was when – as my mother explained- the Germans were the bandits. I remember the story my mother told that caused her the most torment. One early morning the SS called all the villagers outside to watch as they hung dozens of young men from the trees in the village square- my mother’s classmates among them. She would get a look in her eye that I imagine was the same look she had when her eyes watched this horrific event. For many years after the war my mother told me she would wake up in the early morning hours and not be able to go back to sleep. She said the memories of the war would replay in her head over and over like a movie. She did not know the word trauma, but this was clearly trauma. It was hard to know as a child, if my mother’s tendency to live in her head and be emotionally absent was because of this trauma. Her favorite stories of the war were about her family and other villagers helping Jewish people fleeing persecution and encampment. Jews escaping what we would later learn was the holocaust would walk over the alps – sometimes in winter, sometimes with no proper winter shoes to get to a place where they would be safer. Her family and their relatives hid 23 Jews during the war, including while her village was occupied by the Nazi SS. My aunts hid people in the forrest and brought them food and my uncles smuggled Jews south on trains to get them to the American side. And – in an act of great neutrality and impartiality my grandmother took in a soldier in a German SS uniform and hid him from the Germans too—at times side by side with the Jews they were hiding. This solder wasn’t from the batch that had occupied their village and committed countless human rights abuses, he was a polish boy, conscripted into the German army and sent to war at age 17. He showed up at my grandmother’s gate during a march north and ducked into the courtyard. When she opened the door to a knock he handed her his gun. The family burned his uniform and cobbled together an outfit and fed him for 6 months– Quite a feat at the end of the war when they were out of all supplies and clothing. When word came that the Germans were doing house searches, they smuggled him to safety too. Fast forward 50 some years- it’s 1991, I was living in northeastern Thailand teaching English after finishing my bachelor’s degree in Anthropology. I had wanted to go out in the world and explore a question: I wondered, are people fundamentally similar? If I go half way across the world to another culture, with another religion, with limited influence from the west, would people share common values or a common humanity with me? My students were great. I was totally disappointed though that I was living in a concrete row house with electricity and running water. I had hoped for a bamboo hut. My kids were not from wealthy families, but they seemed pretty happy. Something was missing. One day I picked up the Bangkok post and saw an article about the Karen people of Burma who were still waging a war against the oppressive Burmese Junta. They had been at war against an elite and well-funded army since 1948. Hundreds of thousands of refugees had been living in camps in Thailand since the mid-80s fleeing human rights abuses and oppression. So —I did what anyone would do that learns about a war- I decided I must go there. In retrospect I realize this was not a normal reaction, nor was it an accident. At the time, I had no idea how the influences of my parents time in war had gripped me too. How hearing about war so often as a child, made it scary but familiar. Having since read about trans-generational trauma, I see how my going on to work in war zones and natural disasters was something I was drawn to. The subconscious pull to war may have been about being present with and trying to mitigate the suffering of those experiencing today, what my mother experienced as a young woman during World War II. Over the past 25 years that I have been working with war and disaster affected persons, I’ve worn many hats. I began by directing an NGO on the Thai Burma border that focused on the needs of refugee women and children; then worked to document and expose human rights abuses to shame governments or armies into stopping abuses –and– to vindicate those who suffered at their hands. Once back in the US as a refugee advocate, I would travel to meet with refugees or displaced persons from Africa to Asia to bring their voices to policy makers in the US congress, to the United Nations or to whomever was best placed to address their problem. All of this started with that article in the Bangkok post and my decision to leave that comfortable row house and happy students to see what, if anything, I could offer to war affected people from Burma. I want to share with you a few experiences that resulted from my pull to the same circumstances that impacted my parents so deeply. Moments when the question I asked as a young women about our common humanity was answered. Moments when I became conscious of our deep inter connectedness, our inherent worth and dignity, and about the power of mutual respect and kindness. All set in the context of war. As ugly as war is– some beautiful connections, learning, and opportunities came from these very ugly circumstances. Since you may be wondering what happened when I went to the war, I’ll start there. I had gotten a job teaching English in exchange for room and board in those refugee camps I’d read about in the Bangkok Post. Camps of the Karen ethnic people who had fled the war with the Burmese Government. I had taken a 12 hour unairconditioned bus across the country. It was already dusk when the pick-up truck stopped and the driver pointed to a rice field. I started walking across the rice field carrying a small German suit case. It was the suitcase my father carried after the war when he was begging, borrowing, or stealing food to feed his parents. As I hurried across the rice field I heard a familiar sound- one I’d only heard in movies. I couldn’t place it. Then I realized it was the distant sound of machine guns. I could hear every bullet being shot. It was an endless stream interrupted by bigger bangs. The camps were less than two miles from the Burma border and the dry season offensive had just begun. When I finally saw bamboo huts blending in with the gold straw of the harvested rice, I noticed no one was smiling or welcoming. I didn’t realize at the time that this was because the fighting had just begun, and their loved ones- their husbands, sons, brothers and fathers were the ones facing or dispersing those bullets I was hearing. I was assigned to live with Auntie Pearl and her husband and four children -two teenage girls and two younger boys. As I had desired- , I was in a bamboo hut and there was no electricity and running water. There was a beautiful flower garden around her hut. So much about living in a refugee camp with a family was not what I had expected. My idea of what a refugee was was skewed by images on TV of people living under plastic sheeting, who were starving, victimized, and uneducated. I knew something was up when the first night Auntie Pearl served me a 4 course meal including french fries. Over the next month, the family took me in like their own daughter. Well, the spoiled version because they would not let me carry water or cook or do anything but teach my summer classes. At night we prayed together and then went to sleep to the distant sound of machine guns. After a week of them politely watching me eat my dinner alone first, as is their custom for guests, we finally started eating together, thankfully ending that awkward ritual. I would see Auntie Pearl’s face light up when I came home from teaching. She would say in her high pitched voice and British accent “Veronika would you like some coffee”? Auntie Pearl had been a teacher in Rangoon, the capitol of Burma, and had studied at a teacher’s college there. Her husband had a master’s degree in engineering. They spoke excellent English. For Auntie Pearl and her family, living in a refugee camp was as foreign as it would have been for you and me. They had no idea how to cook over a tiny charcoal stove, how to carry water, how to manage with the huge spiders that crawled out of the thatching at night, or how to endure the heat without an electric fan. In Rangoon auntie pearl had ironed her teacher’s outfits, tended to her English garden, and baked cookies in an oven. Auntie Pearl loved her children and her community. She taught in the camp school, designed after school programs for the children, giving them hope for a very uncertain future. Unlike my mother, she delighted in the presence of her children. Unlike my home, in a nice neighborhood and not in a war zone, her family seemed closer, more loving, even happier. Auntie pearl became my second Mom. The Mom whose face lit up with joy when she saw me, who went out of her way to cook me my favorite dishes on a tiny charcoal stove. This 5’3 Karen woman from Burma, living in a refugee camp, was one of my teachers of our common humanity—she also taught me about open hearted love and generosity- including to strangers like me. Until she died in 2005, we continued to stay close. 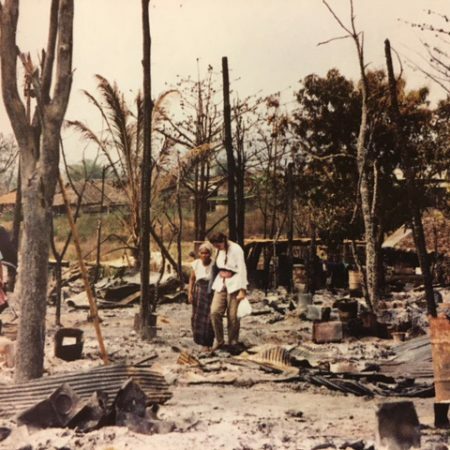 The war did hit close to home when one night the Burmese army started shelling the camp. It was the first time in my life I actually shook with fear. The shells would fly through the air whistling and we waited helplessly hoping they would not land on us. Luckily they just hit the market and no one was killed that year. The photo on the order of service is from 1997, when the Burmese army was successful in attacking the camps in Thailand. The photo is of the ashes of Auntie Pearl’s house. Luckily none of the family were killed. When I left the camp I was both grateful and ashamed of all the choices and power I had in my life. As a white woman born in a democratic developed country, I could get a college education, choose a career of my liking and even marry the person of my choice. I probably had the power, choices and environment to make my dreams come true. My students who complained if I did not give them homework, who read 5 year old newspapers to improve their English, they would be stuck in a camp for another 20 to 30 years. At only 23 years of age, this experience gave me much clarity into what I wanted to do with my life– I knew I wanted to use my good fortune to try and bring more power and choices to those who did not have them. In 1994, armed with a Master’s degree I returned to the Thai Burma Border and started an NGO that focused on the needs of refugee women and children, including the women in the camp I had lived in. After four years of income generation, medical, and educational programs I handed the NGO over and switched gears to human rights work, hoping to better address the root causes of people having to flee Burma and live in the prison of refugee camps. In 1999 I became part of a team that was suing Unocal oil company for human rights abuses committed with their complicity during the construction of a gas pipelines in Burma’s ethnic areas. One of my jobs was to meet the plaintiffs on the Burma border and get them all the way to Bangkok without getting arrested at any of the many checkpoints during the long drive. These people did not have ID cards and were illegal in Thailand. They were also likely on a most wanted list of the Burmese government because they were suing an oil company that brought millions of dollars into the coffers of the Burmese Dictatorship. Long before I knew what a UU was, I was breaking rules for a good cause. I pretended to be a doctor, a UN staff person, and even a nun during my numerous trips through the check points. And I always got through. Once in Bangkok my job was to prepare the plaintiffs for the upcoming depositions. My first plaintiff was a 19 year old mentally disabled girl who said she was raped when she was 17 by an officer in the army tasked to clear the area for Unocal. As is the case in most cultures, great taboo and shame befall a raped women. Jane Doe, as all the plaintiffs were named, had a kind smile and gentle manner as she sat beside her grandmother for the discussion. To ensure her story was consistent with the experiences previously documented by the team, I had to ask her to retell the events of her abuse. When she finished, I went off script, and human to human, woman to woman I looked her in the eye and I said “I’m so sorry that happened to you.” Then this mentally disabled shy young woman, looked right back and said with clear conviction, “what they did was wrong, it really hurt me.” In my many years working on gender and protection I’ve noticed that the mentally ill or disabled are more vulnerable to abuse and exploitation because there is the assumption that they won’t understand that what is happening is wrong, that they are somehow less than and won’t feel the pain or injustice like the rest of us. Thinking back to the question of our common humanity, I learned from this brave young woman—a woman who grew up in a remote jungle village in Burma– that people know to their core when they have been violated, if they have been wronged. It’s not felt with the brain, it’s felt with the heart. I think there is little more destructive in the world than war and its physical and especially its psychological impact on individuals and families. Yet in those terrible circumstances there are opportunities for great love and kindness, for generosity and respect, for empathy and care to each other. As the daughter of parents who survived such trauma I hope I had the chance to offer a moment of human connection and comfort, especially to the many people I interviewed to document the human rights abuses they suffered or witnessed during war. More than the plastic sheeting or food that is handed out there are the moments of compassion and respect across worlds, circumstances, and belief systems that we exchanged. They too took the leap of faith to trust an outsider who at the end of the day, could return to the comfort and safety of her world. Auntie Pearl taught me that the face of a refugee is no different than the face of any mother struggling to raise her children with love and kindness and hope. She also showed me an open hearted love and generosity that my own mother was too traumatized to provide. Jane Doe- the young Karen woman suing Unocal Oil Company at the risk of her own life, reminded me that we all know at our core when injustice happens to us. Regardless of race, skin color, age, mental or physical ability, upbringing or faith, you don’t need a human rights education or a high IQ to know when your human rights are being violated. It’s inherent and universal to all of us everywhere– including our so called enemies. My mother is now 93 years old. Her dementia is pretty advanced; she usually can’t remember what I told her one minute before. But when we sit together and she finds her way back to the part of the brain that is still intact, what she talks about every time is the war; it too left a scar on her mind and heart. Scars so deep her atrophied mind cannot forget them. But you can tell when she recalls the stories about the people her family helped under very difficult circumstances, she still feels proud and at peace.